Photos by Cantieri Amico & Co. The Amico & Co. Shipyard is an intrepreneural reality of international success specialised in repairing and restructuring super yachts. Right from the beginning, in 1991, the company has distinguished itself for the services offered. The results produced have since been in a continuous upward trend and an investment programme which started in the '90s is still underway and growing. Having their head office in Genoa and given the Genoese local administration's conviction on the issue of development and productivity of the yachting world, Amico & Co. have decided to expand even more. 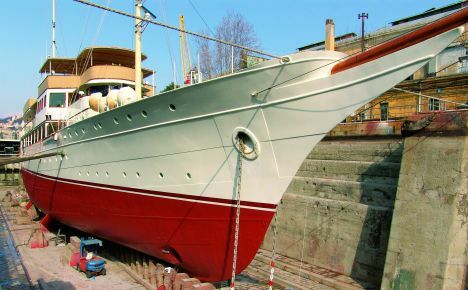 A concrete example of the administration's will together with that of local businessmen to increase investments in the pleasure yachting sector is underscored by The Genoa Trade Fair's restructuring which is being handled by the Port Authority and financed by the Ministry of Infrastructure and Transport. In fact a new marina will be completed with a technical area positioned in its vicinity. This area will be deployed for maintenance and refitting purposes. Local companies and shipyards including Amico & Co. will thus be able to take advantage of the new space made available. Aside from the space they already have, Amico & Co. will also have more new space in protected waters capable of offering mooring facilities to yachts up to 160 metres long.. Thanks to a special system needed to create still water, Amico & Co. will have a water space dedicated to carry out absolutely accurate static tests and other work whereby the complete stillness of the water is fundamental. The technical marina will dispose of all the ecological and security requirements typical to harbours with shipping over 500 tons. A new warehouse, with offices on the top floor, will be built allowing a larger sized crane wagon to enter. The current office space will become a hospitable recreation and working area for crew members. Amico & Co. have from the outset adopted a philosophy aimed at optimizing working conditions of its employees. This is why working areas are closely monitored so as to ensure, cleanliness, order and waste disposal in compliance to environmental needs. This permits staff members to work in welcoming surroundings ensuring high qualitative standards in whichever task they may be faced with. 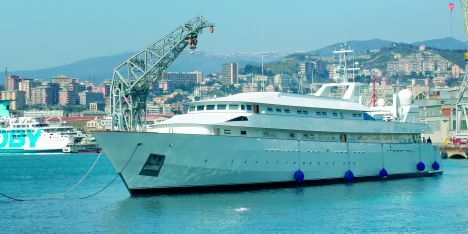 In actual fact more and more yacht owners and charter companies are bringing their fleets to Genoa for repairs and also when these are of a more complicated nature. An example of this trend lies in one of the orders received by Amico & Co. The order consisted in lengthening "Almenwar's" stern, a Nicolini 63 metre super yacht. It wasn't a particularly complex job in itself, but what was worthy of note, was the precision with which it was executed under the constant supervision of Lloyd's Register. The original stern jutted out over the water without a bathing deck. The Middle Eastern owner's needs were both aesthetic and practical. In three months, employing specialized personnel in various different sectors, a modern bathing deck with a double stairway accessing the cockpit was added. The bathing deck's structure was built so as to make it function also as an extra fresh water tank. Another of the accomplished tasks on this yacht was to create a service room to store CO2 cylinders in compliance to fire norms. (The fire fighting system was also reconditioned and modernized.) The structure's ribs and the outer covering was made of 10 mm. steel sheets and soldered on each side as required by Lloyds. Once the soldering was finished inspections were carried out with penetrating liquids and analysed by x-ray in as much as the most critical aspect of the work is matching the structures and soldering them together. On this same occasion, on "Almenwar" two lateral structures were placed in the stern area containing large lockers and a flight of steps surrounded by underwater lighting.